I haven’t really collected much in this direction, but occasionally I will come across a banner or apron or other item (best instance: the Corn / Wine / Oil set!) that I don’t want to pass up. Sort of an odds & ends section of the collection. Spring-loaded hoodwink with a cloth face drape. Mechanical hoodwink is flat-black painted steel with a flip-up hinged blind with a heavy wire handle which is formed in a rectangular structure across the blind and extends as a handle, sinister. Braided black silk or other shiny fiber braiding surrounds the join of the metal portion and the cloth drape. Drape is red velvet lined with black piping, and extends above the mechanical hoodwink, to either side, and down to chin-length. leather. Lower right, a capital letter R is marked on the red cotton backing, seemingly in an ink marker. Two black piping ties, one on each side, are intact and would tie around the wearer’s head, above the ears. Ties are simple black cotton tape, to be tied behind the wearer’s head. DeMoulin hoodwink with slide-action cartridge construction and leather mask. A leather mask with metal cones mounted, leading to a thin, bean-shaped cartridge front. Two spherical knobs on top operate the internal lens sets, one of which is metal as a full blinder, the other being translucent red plastic to mask out certain colors. This would allow an image or scene to be revealed in stages, based on layered color, or to turn a scene red. 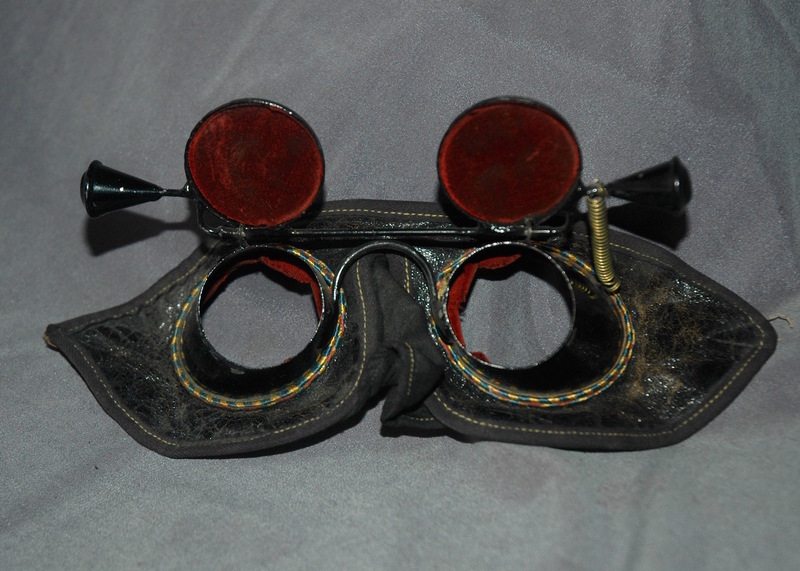 Behind the mechanical apparatus are two metal (steel) goggle cones, which transition to the leather eye mask. 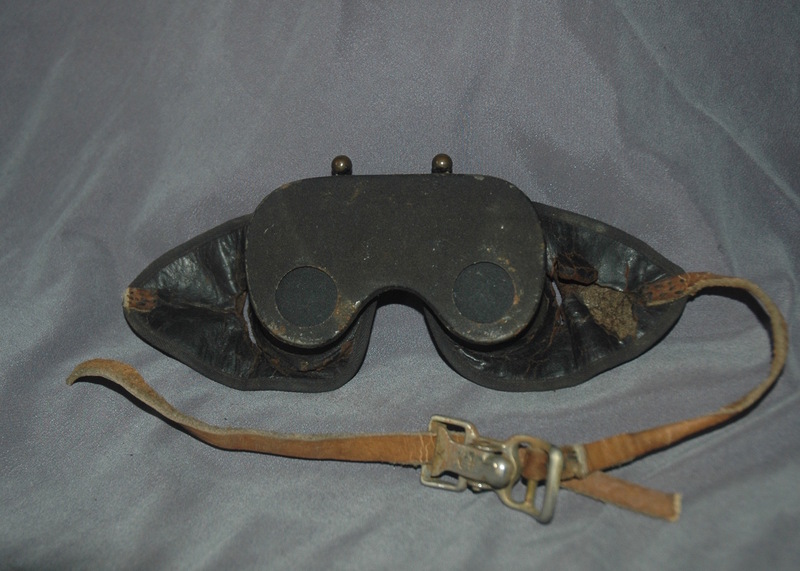 The mask has two heavy leather straps, one at each side (has come apart, dexter), which join with a metal buckle with a spring clip, which is marked with an anchor. The designs for this model are detailed inDeMoulin Catalog 439, reproduced in Burlesque Paraphernalia, 2010 Fantagraphics. Spring-loaded hoodwink by the M.C. Lilley & Co manufacturers. A leather face mask surrounds two metal (steel) goggle cones with a spring-loaded flip-up blinder, with a cone-shaped handle on either side. 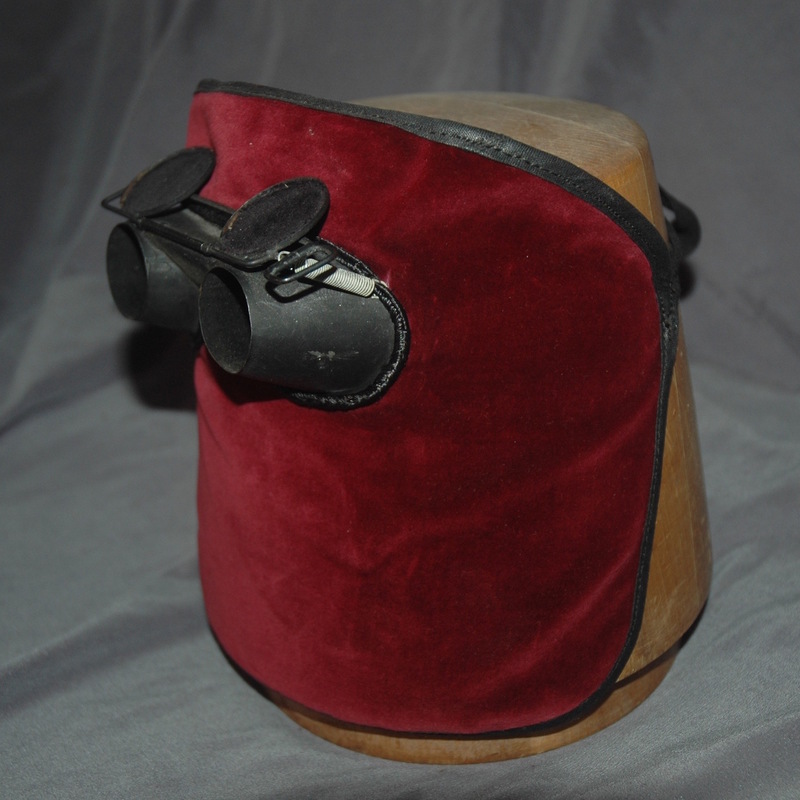 Verso/interior surface of the blinder is lined with velvet to eliminate dust inside. A steel semi-circle joins the two goggle cones, between which is a cloth cup or triangle meant to cup the nose and hold the mask in place. Blue and yellow cord is stitched with rust-colored thread around the join if the leather and metal goggle cones, which are painted with shiny black enamel. 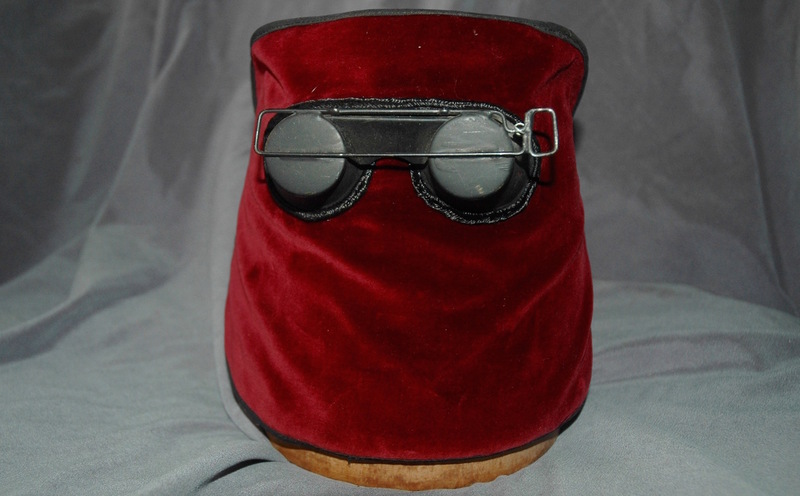 Verso of the mask is lined with red velvet, which is worked into the inside of the goggle cones. Ties are missing, only triangular point remnants are extant, still sewn at either side of the mask. Action on the hoodwink is excellent, and tight. I have challenge for you!!! I’ll bet you can not find an Elks BPOE Apron!!! Any one can find an Elk’s fez. I’ve got one my self. The reason for the challenge is I cannot seem to find an original Elks apron use way back when the Elks did wear aprons while at work in the lodge. That would definitely be find, and Elks apron. I think they stopped wearing them before the turn of the 20th Century! Are there even any images on the internet? I would be interested to see even a picture one, at least. Thanks for commenting!